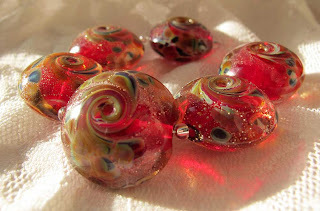 There has been a thread on the forum Lampwork Etc of late with people showcasing their beads made with Zimmerman Z99 purple rose powder and there are some absolute beauties. Now I have to confess that I have had a stash of this for some years now, I think I even have some of the rods somewhere, but for some reason I have never touched it. Obviously I only realised I already had some the second I hit the paypal pay button and bought some more but as it is no longer in production having too much isn't really a problem! I think it has a reputation as being a bit tricky to work because it can devitrify and leave a chalky white powder on the piece, some people like the devit, others not so much. Personally I don't care for it, I think it can make beads look aged and that can be cool but I never plan to have it so when I can't get it and can't get rid of it I get a tad snarky . I have also been making chunky lentils these last few sessions and I love the shape. 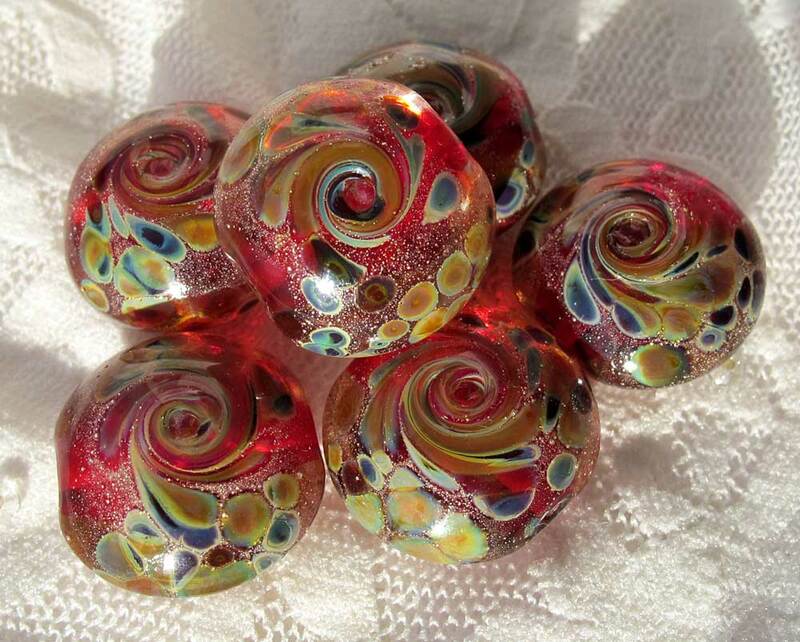 They have a nice large area for decoration and would make a fabulous chunky piece of jewellery. I have some ideas on how to use these so I think I'm going to have to make myself a set. Here is the set I put on Etsy this evening.